Remember Assassin’s Creed Unity‘s gimmicky tie-in app? The one you had to play to unlock collectible stuff in the main game? The cynical sense that the whole endeavor was an exploitive attempt to foist an Ubisoft-ified Internet of Things on us? The company finally wised up in February and decoupled the app from the game with a mea culpa patch. 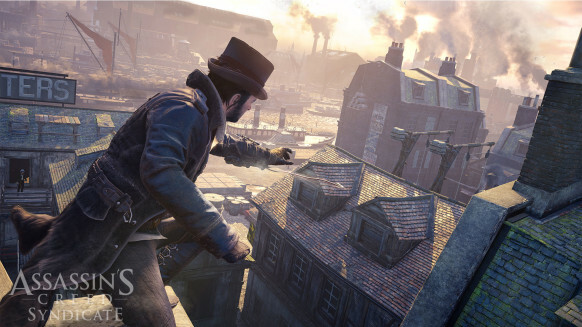 And today, it’s gone one step further and promised that Assassin’s Creed Syndicate, the next installment set in Victorian London, will ship app-free this year. Hum a bar or two of “Born Free” with me. 2014 was, as far as I’m concerned, the first bum year for the whole Assassin’s Creed franchise. Ubisoft clearly overreached, rolling out not one but two full-fledged Assassin’s Creed games, and the strain on quality control was obvious. Rogue‘s boreal beauty didn’t offset the sense of traipsing through a desolate world with filler storytelling and boring checklists. And Unity…well, pity that busy monster, an ambitious mess of a parkour sandbox punctuated by heartbreakingly beautiful vistas, but whose chief deficiency the media mostly missed in its rush to righteously grouse about glitches: Arno, the pouty lead, was a bore, his characterization flat, his journey at best a story-of-the-week affair. So given the whole “back to one game a year” and “no gimmicky tie-ins” thing, I’m a trifle more optimistic about Syndicate—though it may also be time to put more than a year between these games. A series that launched less than a decade ago shouldn’t be able to count more mainline releases than years.